This entry was posted on Wednesday, August 1st, 2012 at 13:15 and is filed under Activism, Budget, Congress, Featured, GOP Establishment, News, Politics. Leaders have quit? Will newly elected ones lead? Constituents….what are they? Just a means to a end…end justifies the means. We just get continuing condolences til next time. Two for the house, four for the executive, six for the senate…two, four, six, eight…they all procrastinate. Go team, huh? Sadly, that sums it all up accurately. The fourth point from Heritage that a strong reaction by people and markets as early as September rather than January may be a Republican strategy to have the Dems hang on their own rope and thereby favor the Republicans in November. 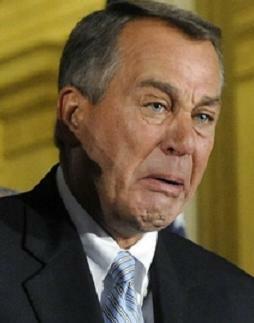 Boehner is just an Obama tool. I’m sorry, but we are seeing clear indications of what to expect from a Romney/Boehner/McConnell coalition. None of them are fit to lead. Ohhhh but- but – but – the ‘Conservatives” are gonna hold ole mitt’s well shod feet to the fire and he’s going to follow their lead – I’d like to know where their universe is located – where have you been? The GOPE have been pushing this meme on C4P for quite some time now – gotta vote for mitt & hold his feet to the fire & everything will be just fine………………. I’ve said before & will keep on saying – if one declares themself to be a “Conservative” , then there is no way in hell one can vote for the plastic kendoll flip flopper – take off the rose colored glasses & see what is right in front of you – there is NO difference between the two wings of the party – the D’s will take us over the cliff at 100 MPH – the R’s will do the same thing only slower………………. either way, this country is screwed and so is the American public. Like also. But it will take a long line in Tampa to pull a Chick-fil-A. Old boy still says…know when to hold them, know when to fold them, know when to walk away, know when to run. Cliff may not be dead drop off. Grab a projected stone and hold on. Make a next time available. ABO..then make ’em oink.! Then there is a chance.